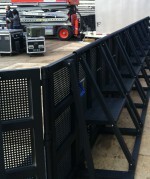 PATMAN Productions is now carrying full stage barricade systems for rent at your event. 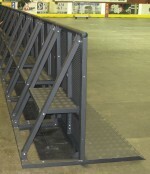 This new high-tech heavy-duty aluminum crowd control barrier will be available in various lengths forming up to 192 feet, with 8 articulated corners, for stage thrusts, or other barrier configurations. 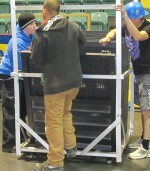 All barrier systems will be shipped to events on wheeled carts, which allow for easier and quicker set-up and tear down, in addition to easier shipping and storage. All barrier systems are black powder coated heavy gauge aluminum with rounded top and tapered base plate ends for added safety to all patrons and staff. Our barricade is interlocking and sets up, or is taken down in just minutes. Full details and specifications can be seen on this PDF page.